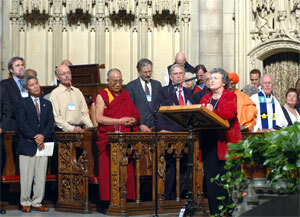 Sister Joan gives the closing prayer at the Peace Council's interfaith service in New York's Riverside Church, September 26, 2005. Sr. Joan gave the following talk at a Peace Council fundraising dinner in June, 2005. It’s that kind of vision that is the heritage of philanthropy. That kind of giving explains the difference between charity and philanthropy, between public posturing and real giving, between making a simple contribution and becoming socially effective, between the use of money and the ministry of money. This is the vision and risk that takes the dreams of today and makes a better tomorrow possible. Philanthropy is the personal ability to make something wonderful happennot just for now, but for always! • In philanthropy it is the vision of the possible that impels, not the guarantee of success, and certainly not the promise of personal profit. • The kind of philanthropy that changes the world is often practiced in very unexpected ways. The Carnegie libraries that dot the entire country of Ireland, for instance, were put there before the Irish even had a centralized school system. Real philanthropy approaches a problem in ways that often have never been used before. • Great philanthropic ventures are frequently discovery of the obvious. It’s the awareness of what hasn’t been done but obviously needs to be done that drives the philanthropist: the need to encourage artists; the need to develop scientists; the need to foster human understanding; the need to build oases of peace in a world given to enemy-making. • Philanthropy is even, at times, apparently rash. Who would put money into such a wild programlike an international peace council of spiritual seekers, who bring simple people together out of warring cultures when their governments are dedicated to keeping them apart? “Generosity lies less in giving much, than in giving at the right moment” (Gruyer). Giving before other people realize that there is something worth doing that is not being done is what distinguishes philanthropy from donation. Philanthropy is a holy commitment to enable what everybody else is prudent enough, shrewd enough, to be cautious about. Philanthropy is that deep down nagging awareness of what must be, even when other people are still oblivious to what is really neededand so is yet unrealized. Philanthropy is a vision of what is necessary before it seems possible. The scripture says of it: without vision, the people perish. The point is: great things happen when vision and serviceresources and peoplesome people’s determination and other people’s financial supportcome together at the same time, in the same place, with the same kind of giving hearts driving both of them at once. Great things happen when dreamers dream of peace and givers give the resources needed to make those contactsthat’s the team that changes the world. And that’s what tonight is really all about. Tonight is not the night to talk about specific projects, or the people and places and programs that make such global outreach real. Tonight is the night to talk about you. This is your night. It is about you as the bearer of the great and holy tradition of co-creation, of finishing what God left for us to finish on our own. Tonight is about you and your own vocation to go on developing the world. It’s about you and the long line of gracious givers before you who throughout all time have been a sign to others of the high human task of continuing what God started but left to us to complete. Philanthropists of the world: you are the world’s keepers. You are its creators. What you are, what you give, this world will be. You plant the seeds. You are our hope. Unfortunately, the spirituality of giving has been reduced in our time to a new kind of greed by an economic climate that forgetsif it ever knewthat to be truly human, humanity always seeks to be bigger than itself. Talk about foundation grants and tax write-offs and social expectations and civic responsibilityall of that God-awful languagehas obscured, minimized, actually trivialized what is really going on when free-spirited, open-hearted, gratuitous giving happens. When giving goes on, life goes on. When giving goes on, we rise above our private, paltry selves to the stature of those spiritual colossi that make heaven a place we can all imagine on Monday and go to on Tuesday and be proud to have had a part in building every day for the rest of our lives. And does that really happen? Well, I’ll tell you: the fact is that real giving happens only through you, and always through you. According to the American Philanthropic Foundation Research Center, individualsindividuals!regularly give over 80% of all the charitable donations that are made in this country. That’s how good things happen. Almost everything that happens in this country, in other words, happens because individuals, good people, who have worked hard to make their own money, know the grace, the call, the power of giving it away. Philanthropists hear the call to make their money keep on giving. They know the spiritual secret of giving that makes the future possible. The point? No women, no Jesus, no philanthropy, no new world. The philanthropist stands in the shadow of the patrons of Michelangelo, of Johann Sebastian Bach, of the medieval monasteries that began the educational and social centers of Europe, and Wolfgang Amadeus Mozart. And the philanthropists here today stand in the shadow of all those before usCarnegies, Rockefellers, MacArthurs, Kennedyswho gave of the substance of their lives to build our institutions, to sustain our communities, to become the driving force, the center of intellectual energy in the world so that our world might be above national chauvinism, beyond religious denominationalism, opposed to discrimination, and committed to human development. Their vision and commitment to humanize this world and make life more humane for every human being in itwhatever their color or class, whatever their gender or agefired their generation and challenges our own. They brought a new quality of life from one end of the globe to the other. And they distribute their money for the sake of distribution alonenot to be recognized as socially responsible, for instance; not to rank with the socially prominent, for instance. No, the great philanthropists, the real philanthropists, risk their money for something far more worthwhile than the money itself. Philanthropists, you see, are people who spend today to build tomorrow. That’s the spirituality of giving, the ministry of money. The great Jewish philosopher Maimonides taught that there are four levels of righteous giving: Level one involves direct giving to beggars on the street; Level two involves giving indirectlythrough community collections, for instanceso that we cannot feel that anyone owes us anything; Level three is to give in such a way that the recipient does not know the donor and so is not ashamed of their neediness. But Level fourthe highest level of giving, Maimonides teachesis to give to the other in a way that promotes self-sufficiency. The Peace Council you honor tonight with your presence gives voice to the voiceless around the world who are being used up and ignored by the warmongers of the world. Indeed, philanthropy is the only proof the suffering have that God is still alive and listens to them too. Charity only concentrates on meeting the needs of the day; philanthropy provides a vision of tomorrow. The highest form of philanthropy, in other words, does not sustain, it enables. It seeds. It creates what is needed in every generation. Now in our time it is peace that it is needed. It is peacemakers who must be sustained. It is peace across boundaries that must be seeded and sustained. Never, ever, underestimate the power of the holy vocation of the ministry of money. Never for a moment confuse a spiritual commitment to co-creation with tax write-offs or estate planning. And never for a moment think that you are really giving anything away. The more you givewe have it on the best of authoritythe more it will come back to you one hundred fold, both in this world and the next. And in the meantime your gifts to the Peace Council will begin to turn a world of clay into the community it was always meant to be. Believe it: giving is a holy, holy thing. The globe and its children, the world and its institutions, the country and its visionaries, live and thrive on the holiness of the givers, live and thrive on you who hear the cries and make our most precious dreams possible in the name of the children and the world to come. We are calling on you to secure tomorrow for them and, most of all, to teach us all what it is within you that enables you to give your gold away. For all our sakes, teach us that, teach the city that, teach the world that.